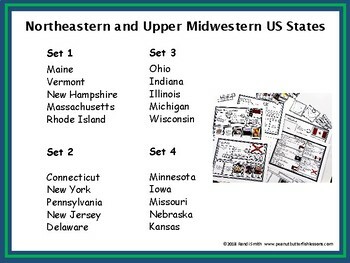 Looking for a fun, hands on activity for students to review their knowledge of US states? These sorting mats will challenge students to recall the information they have studied and use their critical thinking and/or research skills to fill in the information they don't know. By using both hands as well as their language, visual and critical thinking skills, they will engage their whole brain during this activity. 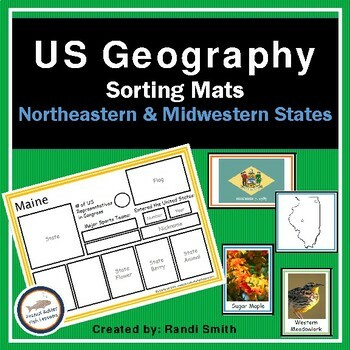 This set contains sorting mats for 20 states, divided and color coded into sets of five. 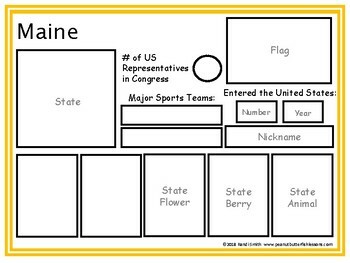 Students will match the picture, flag, capital and major cities, nickname, state symbols, facts, # of US Representatives, when each state entered the union and local sports teams to each state. An answer key is included for students to self-check their work. Print and prep once and then use for years. Makes a great addition to any US geography curriculum. 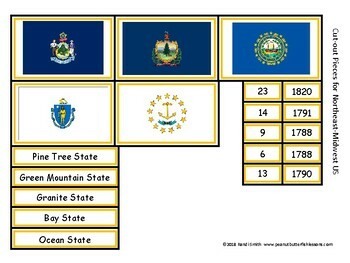 This set includes: Maine, Vermont, New Hampshire, Massachusetts, Rhode Island, Connecticut, New York, Pennsylvania, New Jersey, Delaware, Ohio, Indiana, Illinois, Michigan, Wisconsin, Minnesota, Iowa, Missouri, Nebraska, and Kansas.